Nearly a fifth of all jobs in the region are higher-paying, mid-skill occupations. These are jobs that commonly require education and skills beyond high school but do not require a four-year college degree. Nurses, supervisors, sales representations, truck drivers and machinists are among the higher-paying, mid-skill occupations that employ the largest number of workers in Western New York. 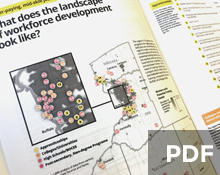 What does the landscape of workforce development look like? What are characteristics of trainers? Where in the region are employers and others sponsoring apprenticeships? 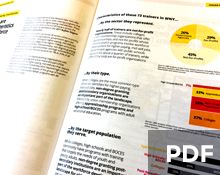 What does the support system look like across the region for workers? Data Sources & Notes: Organizations that offer training and the workforce supports shown on the map were compiled by UBRI from various sources. 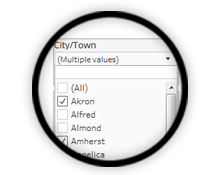 These include LMA/17 Buffalo Niagara Labor Market Assessment, Inventory of Trainers; NYS Education Department, 2016 School Report Card; NYS Department of Labor, Apprenticeship Opportunities, WNY, Eligible Training Provider Listing, 2017; JobZone Database, WNY Training Providers, Active Offerings by SOC; National Center for Education Statistics, Integrated Postsecondary Education Data System; Infogroup, Inc. Reference USA, U.S. Business Database; U.S. Department of Labor, College Scorecard Database; and online research conducted by UBRI. 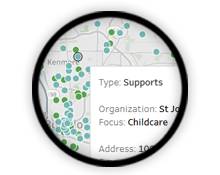 Only childcare providers with 20 or more employees are listed. Higher-paying, mid-skill jobs are job titles offering a median annual wage of $38,500 as the minimum. They typically require some education and/or training beyond high school but not a four-year college degree. What colleges and vocational institutions offer degree and certificate programs for higher-paying, mid-skill jobs? 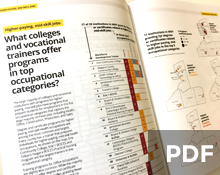 What colleges and vocational trainers offer programs in top occupational categories? 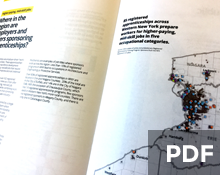 Data Sources & Notes: Higher paying-mid-skill jobs include occupations with a median wage of $38,500 or more, according to the NYSDOL Occupational Employment Statistics, 2016-Q1, and do not typically require a bachelor’s degree or higher. The definition also includes occupations in the regional economy that have an experienced wage of at least $38,500 per year and an entry wage of at least $30,000. Registered Nurses are also included in the definition, even though the NYS Department of Labor classifies this occupation as typically requiring a bachelor’s degree since a four-year degree is not required in NYS to work in this occupation. Occupational data is from the NYS Department of Labor’s Occupational Employment Statistics (OES) for WNY, 2016-Q1. Occupational categories follow the 2018 Standard Occupational Classification (SOC) system at the two-digit level. Degrees and certificates granted by trainers in WNY for higher-paying, mid-skill occupations are from CareerOneStop, sponsored by the U.S. Department of Labor, Employment and Training Administration, Local Training Finder, accessed March 2017. Trainers and training programs were identified using six-digit occupational codes. 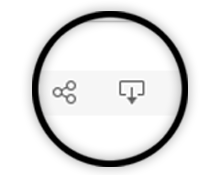 Degrees and certificates are also from CareerOneStop and reflect those granted to graduates in 2013, as reported to the National Center for Education Statistics. Degrees and programs reflect schoolwide figures for Western New York. Not all programs of study may be available at all school locations, for schools with multiple campuses in the region. While higher-paying, mid-skill jobs do not require a four-year college degree, some job holders may earn one. 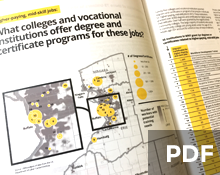 The data shown here includes colleges and universities that offer all levels of degrees and certificates relating to higher-paying, mid-skill jobs.